Are we more like the Romans and less like the Renaissance Florentines (for whom Michelangelo sculpted David)? Is our treasury in debt and are our armies over-extended like Rome in the 4th century? ...Or like 15th century Florence, are we developing skilled trades, critical thinking, humanistic arts, and expanding our influence through peaceful commerce? Or am I reading too much into an advertising campaign that is trying to get people like me off their duff? Image found here. Hey, what's with the name calling? If an attorney calls to ask if I'll join in filing a class action suit against this campaign, I'll have to be like the Michelangelo statue and think about it. 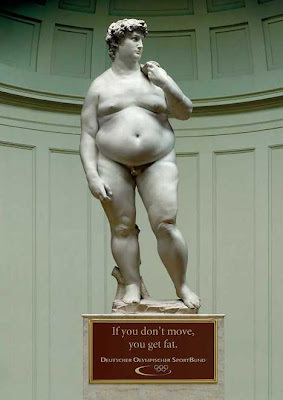 David, I know you're physique is more like the original than the fat one. Me however, I'm not so sure..